Sixteen Democrats vowed Monday to oppose Nancy Pelosi for speaker on the House floor, throwing the California Democrat’s bid to reclaim the gavel in serious jeopardy. 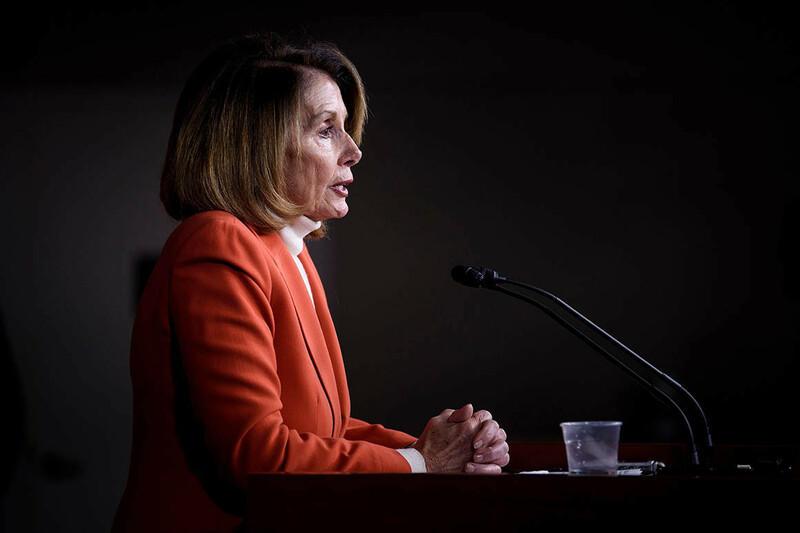 In a highly anticipated letter that went public Monday, the Democrats praised Pelosi as “a historic figure” but argued that it is time for change at the top. The show of force underscores the depth of the challenge facing Pelosi, who has led the caucus for 16 years. Pelosi needs 218 votes among lawmakers present and voting to be elected speaker on Jan. 3. House Democrats have won 233 seats, meaning Pelosi can currently afford to lose only 15 votes. That would bring Pelosi’s opponents to a total of 19 members or members-elect committed to voting against her — enough to keep her from becoming speaker should those members refuse to budge. Three House races in Utah, Georgia and Texas have not been called but are trending toward the Republican incumbents. Should Democrats prevail, Pelosi could have more wiggle room and could lose as many as 18 votes. “Leader Pelosi remains confident in her support among members and members-elect,” Pelosi spokesman Drew Hammill said in response, noting that 94 percent of the caucus didn’t sign onto the letter. Rep. Kathleen Rice (D-N.Y.), one of the group’s ringleaders, dismissed the criticism that only a handful of caucus members publicly signed onto the letter. Rice told POLITICO that Pelosi is likely to win a closed-door caucus vote next week — which only requires a majority of members to vote in her favor — but that the members vowing to oppose the California Democrat plan to stand firm on the floor. In addition to Rice, letter signers are Democratic Reps. Tim Ryan (Ohio), Seth Moulton (Massachusetts), Ed Perlmutter (Colorado), Kurt Schrader (Oregon), Filemon Vela (Texas), Bill Foster (Illinois), Brian Higgins (New York), Stephen Lynch (Massachusetts), Linda Sánchez (California) and Jim Cooper (Tennessee), as well as Reps.-elect Jeff Van Drew (New Jersey), Joe Cunningham (South Carolina), Max Rose and Anthony Brindisi of New York, and candidate McAdams. Additionally, Pelosi’s critics had been trying for weeks to garner 20 signatories on their letter. They fell short of their own goal by four names — five if McAdams is excluded. Still there’s no denying the gravity of the predicament before Pelosi. And simple math suggests that the minority leader will have to cut some sort of deal with her critics. Many of the letter’s signers have told POLITICO that nothing can make them change their mind — no plum committee posts or chairmanship, as have been used as a carrot for Pelosi critics in the past. Van Drew told POLITICO last week that he would not change his mind for anything. “I expressed my view, and I’m not going to be voting for her — not in caucus and not on the floor,” he said. But Rep. Marcia Fudge of Ohio, a Pelosi critic who is considering a bid for speaker as well, suggested to POLITICO in a Friday interview that Pelosi could possibly win her support should the Californian declare that she will serve for only one more term. Fudge had signed an earlier version of the letter but apparently has withdrawn her signature; she was not on the letter released Monday. The threat by Pelosi’s critics — whom some on Capitol Hill have dubbed the “rebels” or the “revolutionaries” — has the potential to throw the entire party into chaos just as Democrats are trying to turn their fire on President Donald Trump and pivot toward ousting him in 2020. It’s irritated many in the caucus who say they should be fighting Republicans, not each other, and who argue that Pelosi has the know-how to lead the party at such a critical time. “This is where we stand, this is how we’re going to vote. We heard the voters on Nov. 6, and we are going to help bring about change, even if it comes at some political cost here to us in Washington,” Rice said.